Earnings are looking shaky for the mall-based REIT, which could mean a reduced dividend going forward. 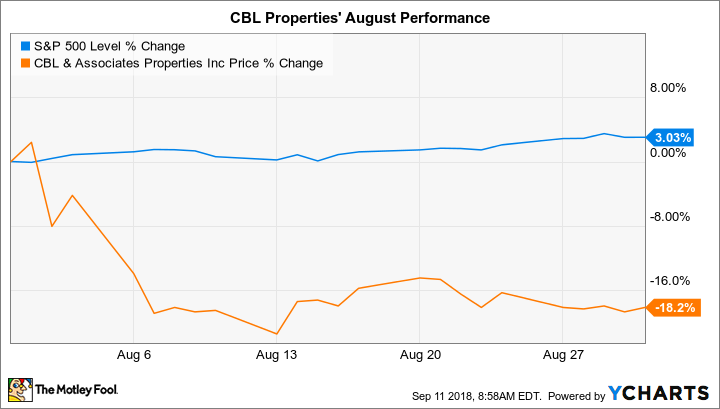 CBL & Associates Properties (NYSE:CBL) stock trailed the market by shedding 18% last month compared to a 3% increase in the S&P 500, according to data provided by S&P Global Market Intelligence. The slump added to a tough year for investors in the mall-based real estate investment trust (REIT), whose stock has dropped more than 40% so far in 2018. The REIT met expectations for its fiscal first quarter, but the results still included a few areas of concern for investors. CBL Properties said in early August that its occupancy rate had worsened to 91.1% from 91.6%, for one. And funds from operations, an industry metric that correlates to profits, fell 8% to $0.46 per share thanks mainly to rising expenses on a portfolio of Class B and Class C malls. The REIT is hoping to protect earnings over time by diversifying away from struggling apparel-based department stores. It took an encouraging step in that direction recently by signing a new lease for a casino, entertainment, and dining complex located in Greensburg, Pennsylvania. Management also hopes to strengthen its balance sheet with targeted property sales. Still, the weak short-term earnings outlook suggests a dividend cut could be on the way, which may or may not do enough to lessen CBL Properties' significant debt burden.